We had the honor, the luck and the joy to welcome Laura Evangelisti to Marseille France for the Yantra Yoga Level 2 supervision of Elerin Uibu. We focused on learning the 3rd and 4th series of movements in a relaxed and applied atmosphere. Twenty people appreciated this precious exchange which also allowed us to deepen the preliminaries and to practice the Pranayama of the 2nd and 3rd series. We would to renew this experience because the presence and knowledge of Laura were very useful for us. 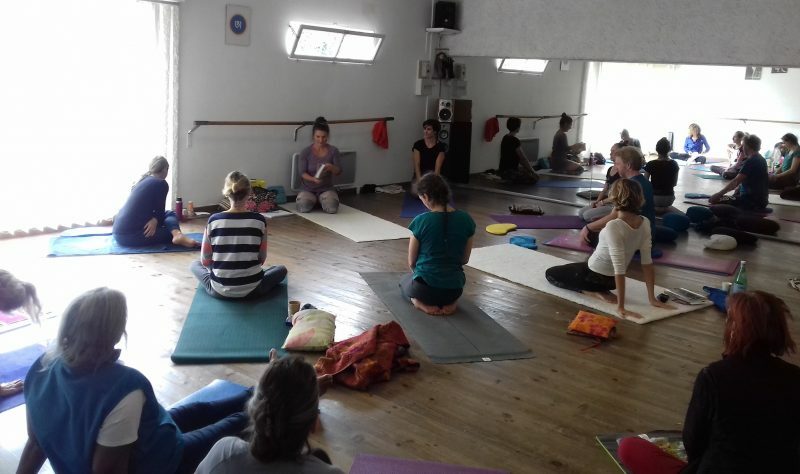 A big thank you to Laura and Elerin for their commitment to convey as accurately as possible this fabulous yoga that has so many benefits for all ages and conditions. Many thanks to Laura Evangelisti, Elerin Uibu and Rachel for these 5 days during which we were able to immerse ourselves in the practice of Yantra Yoga. A very big thank you for the precision and the clarity of the teachings, for the corrections which allowed us to improve our postures, for the collective practice of the Pranayama which helped us to feel a great inner calmness; and finally a big thank you for the welcome, the organization, the warm atmosphere and the pleasant and bright place in which we all could practice harmoniously.